Create FUN and EXCITEMENT at your next event with Snazzy Photo Booth! Photo strips offer a personalized party favor that your guests will treasure for years to come. "We had so much fun in the booth and the pictures turned out beautiful"
We offer premium photo booths and exceptional service. Our packages are custom designed to offer you flexibility and value. Contact us for availability and a custom quote. 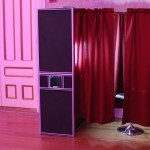 The Snazzy Lounge is an 8′ x 10′ area made out of pipe & drape with the Snazzy Photo Booth inside! The lounge can handle up to 15 or more people at once. This would be great for larger receptions or events. This Photo booth needs an area 8′ wide x 10′ long. *Premium photo booth services covering entire lower Michigan.